Yesterday, like most Mauritians, I listened to the Budget Speech 2007-2008 while attending to my usual chores. Another nice measure is the fact that there is now only one flat rate of 15% for (taxable) income tax. If my brain works correctly, this means that I will pay less tax compared to previous years and this is a good thing. p9 – 53. we are amending legislation to give the Tertiary Education Commission (TEC) full authority to allow foreign training and educational establishments in all fields to set up in Mauritius. p38 – 228. Our vision is to transform Mauritius into a knowledge-based economy. We have, therefore, opened the country to international institutions of learning. Ramachandra Medical School and Eastern are part of the first wave that we plan to attract. Several institutions of high repute have expressed a keen interest to develop a campus in Mauritius. In addition to becoming a hub and attracting foreign students, the entry of tertiary institutions will broaden the opportunities for our children to have access to Tertiary Education. Personally, I welcome the arrival of other tertiary institutions. Of course, this might be detrimental to the UoM as far as the number of students enrolled every year is concerned but I sincerely think that the best students will continue to choose the University of Mauritius if we, academics, can focus on quality teaching and research. 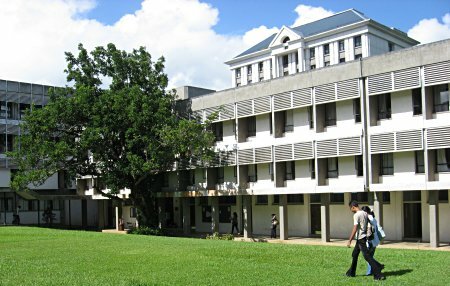 Having fewer students might be the best thing ever to happen to the University of Mauritius… given our limited budget and limited infrastructure. p24 – 140. Seventh, as we develop the knowledge hub, and with more tertiary education institutions being set up in Mauritius, Government will encourage the setting up of University-SME Partnership Programme. The universities can establish consultancy arms to provide managerial, financial and technical advice to SMEs on demand. Consultancy is an activity which can prove to be highly beneficial both in the financial and the intellectual senses to all parties: academics, SMEs and the country as a whole. Many of my colleagues and, of course, myself are willing to participate in consultancy activities. I’ve read the Budget Speech this morning and there are not a lot of extravagant measures in it. My feeling is that the Minister of Finance is trying to strengthen the economy of the country without being irresponsible. I believe that economic growth (croissance) is needed if Mauritius wants to succeed. I don’t know whether this will work or not but I am somewhat positive. Developing the Mauritius knowledge hub with more tertiary education institutions and the setting up of Partnership programme are the direction the Minister seems to be heading for. The U of M model being practiced today,looking from a layman point of view is some what out of sync with to day’s challenges.The gap between what is dispensed and what is required from the students seem to be in many field too wide. Tertiary institutions on the model of Institutes of Technology produce better graduates for the industries.I am reading a book on the present successes and impact of the various Indian Institutes of technologies (ITTs) which have far reaching influences beyond the bounds of India.Indian graduates from the ITTs are now playing leading roles in the Silicon Valley California. The movement was initiated in the early 60’s by Mohanmohan Singh the present PM of India in his recommendation after his diagnosis of the economic situation of India. The ground work of the project was then worked out by Dominique Pecoud, then Dean of Loyola University. Producing ready for the appropriate job graduates should be the most sought area for our stage of development. Consultancies in industry if properly set up may well provide interaction between academia and needs& practices in industry. Though I still maintain that University has still to maintain the task of producing intelligentsia in the basic fields to pursue fundamental research. Flat income tax rate of 15% across the board, regardless of income level? Will a labourer pay as much tax as a company director? Joseph: Work-driven training institutions should complement the university instead of the university changing its role from forming academics. That would make everyone happy, but with limited resources, there is only so much that can be done. I was at IIT Kanpur for the ACM Programming Contest in December and, as far as I’ve understood, IITs are the best tertiary level institutions in India. In fact, they are somewhat similar to the Ecoles d’IngÃ©nieur found in France. I think Mauritius should have something similar. And I think that the University of Mauritius is ideal for this. The reason is (obviously) us, academics, who are (theoretically) among the best in this country and therefore capable of coaching the best students. If only we can convince people that we need to take less students every year then things will work out well. In fact, this “simplification” exercise is being done in parallel, as far as I understand, with a much stringent tax collection process. The Mauritius Revenue Authority is even sending inspectors to those teachers who become millionaires by giving tuitions and who, of course, traditionally “forget” about declaring this additional income. I guess that both measures taken together will (i) increase the amount of tax collected and (ii) give more incentive to investors to come to Mauritius. The budget has many aspects: political aspects- The labour party needs to stay in power, so they need to satisfy party investors, big family business demands. I accept there are good things too but till today a 9 year old kid is leaving home at 7.30 am ,going to school with lots of books and a big bschool bag till 3.30 pm .. going to tution with the same teacher at school till 5.30 pm returning home tired .Has the budget relieve his life or even the parents’ expenses. Building lots of school ..is it what the population really needs or is it something else. The price of medicine is increasing every year.To go to a doctor ..you need to put at least Rs 800 minimum in your pocket.What has the budget done to relieve that?imagine if a whole family has flu or fever. you pay for a private course either in a private institution or at UoM ,these are not deductible in income taxes? Is it encouraging a knowledge hub for poor people . Life insurance too not deductable..Is it encouraging a poor family to acquire an insurance if the man of the family dies? Empowerment fund- How many will succeed?If you don’t have one million rupees,it’s difficult to build a surviving business to compete in a good industry today.I’m waiting to know out of 26,000 people registered ,how many will survive and how many will be frustrated ? I really think the govt should reduce the price of food , alimentation ,books, medicines , communication ,Sc,HSC fees…I don’t see the quality of life improving.Who are the real people benefiting from ‘transport gratuit’ , who is feeling more secure today.will putting cameras only in Port louis reduce drug trafficking.How many children can eat fruits everyday, fish twice a week..I really hope we are going in the good direction avinash.But I just hope poor people conditions do not worsen as regards the factors mentioned above. But I am convinced that a country as a whole only progresses when its economy (i.e. the private sector) moves forward. SMEs are really the key to our future. Doing something right and doing the right thing may have different conclusions. I am reading a book on the present successes and impact of the various Indian Institutes of technologies (ITTs) which have far reaching influences beyond the bounds of India.Indian graduates from the ITTs are now playing leading roles in the Silicon Valley California. Don’t you think that it is the process of selecting the ‘best’ candidates at an early stage will yields this result? Out of a population of 1 billion, it is no big surprise to me, that these candidates will shine, be it in Silicon Valley or elsewhere. IMHO this flat-rate taxation measure in Mauritius is simply a gift to our richer citizens. No doubt the middle-class will benefit from this, but history has shown that the population pays it back in other indirect taxes. Not sure that taxing the ‘frauderes’ will compensate for what our government will not reap as fiscal revenue due to the flat-rate. quote: and (ii) give more incentive to investors to come to Mauritius. External investors who are not Mauritian residents/citizens, will not be impacted by this measure. (I did not go into the budget details, so I may be wrong). I think you are right that there is a risk that the government lose some money in this flat-rate taxation of 15%. But my guess is that this additional money in the hands of the population will enable people to create more startups, SMEs etc. I believe that Sithanen is banking on wealth creation being done by the people instead of the government. Whether this works or not depends solely on us. Don’t you think so? True. The students at IIT are the best. And this is why I think the UoM should find a way to attract the best. This is the role of a any good university. Someone asked me the other day what is a university. I thought a lot about that and I told him that, IMHO, a university is a place where intelligent people meet and exchange ideas. Empowering the people by giving them more purchasing power is in itself a very noble initiative. I hope this is the motivation behind this set of measures. Giving people more purchasing power leads to economic growth only under the condition that the extra money not paid in taxes is spent on local goods or services, and not to on imported goods. Taking into consideration that social welfare and education should not be left aside, there’s huge work ahead, but let’s be positive: we can make it! I too believe that education is a key to all this. Um, there’s one thing about the arrival of other universities in Mauritius. That’s competition right? I suppose that when the UoM faces some competition is will have to improve (or perish). The Hakka clan’s motto : first “survival” through hard work; Second “Education” or knowledge building. This is the key of success of the Hakka diaspora through out the world and in Mauritius. Definitely uni is an place where intelligent people meet to share ideas.Concerning International Students,according to me they seem to be more priveledged in getting admission here compared to other mauritian people who don’t have any seat despite having good results.Uni seems to accept more international students maybe showing how international and open our uni can be..I think its a bit sad not to care for our own people..
plus crappy machines and internet connection..
and they still take students to be college kids.